Currently Costa Rica has 2 international airports. The largest is in the capital city of San Jose (SJO). The closest is a much smaller and newer one in Liberia (LIR). Flights to both airports are available from many airports in the US and depend on your preferences and schedule. 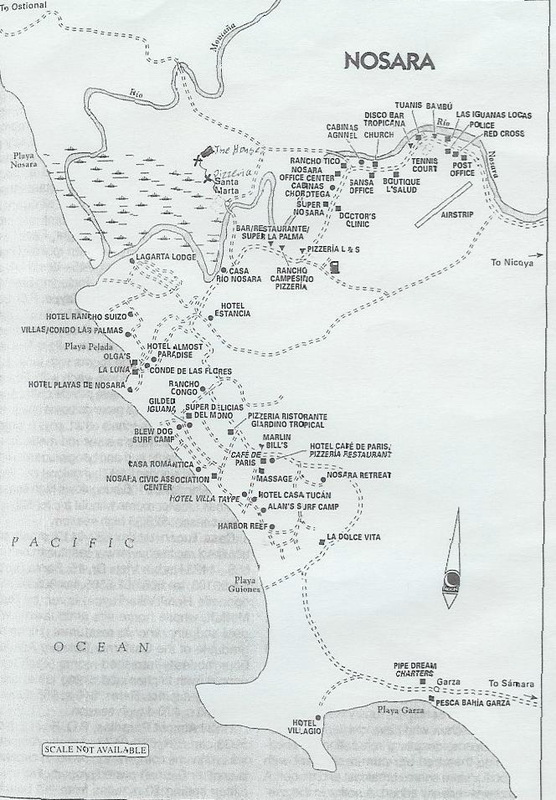 From both airports there are several ways to get to Nosara (see below maps) most of which require renting a car. And for La Casa Que Canta, as well as most places in Nosara, a 4-WHEEL DRIVE VEHICLE IS REQUIRED. Costa Rican roads are notoriously bad, as is their public transportation, so please drive with care! 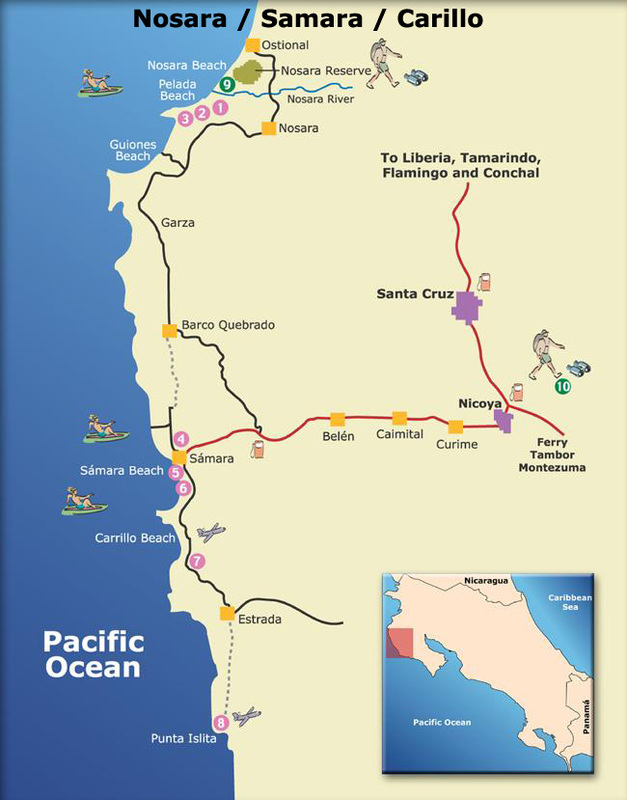 If you choose to drive from San Jose, take the Panamerican Highway # 1 via Palmares, San Ramon, Esparza, towards Puntarenas. You pass the exit to Puntarenas and continue until you see the sign to Tempisque. (You will see a Shell Gas Station on your left). Here turn left and drive towards Nicoya. You will cross the new Tempisque Bridge and continue driving following the signs to Nicoya. The journey should take you about 4 hours to here. If you are flying into Liberia follow signs south to Santa Cruz and Nicoya. (Watch out for man-eating potholes.) You will be on the road for about 2 hours. Once in Nicoya downtown FILL UP ON GAS, GO TO A VERSATELLER AND GET OUT AS MANY COLONES AS YOU CAN (135,000c IS $300US and Banco Popular on the main street seems to work best). Continue straight on the main street in the direction of Samara Beach. Once on the paved road to Samara you will see small white signs with black block letters directing you to Nosara. TURN RIGHT AFTER THE ONLY GAS STATION (which happens to be on the left) onto a dirt road and say hello to 4-wheeling for the rest of your trip! Continue on this road for about 1/2 hour until it forks. Turn right and drive for about another 1/2 hour before you start seeing signs for Guiones. Once in Guiones turn left at the main intersection of Cafe d' Paris and Coconut Harry's. You can't miss it. This is the closest thing to a city center in the area. Sylvia will be in the 3G offices on the corner just past the pharmacy and bank. She will have keys for you and will be able to direct you or answer any questions you might have. WELCOME! One thing to consider - We strongly cannot recommend driving long distances after dark anywhere in Costa Rica, especially if you don't know the way. If your flights bring you in too late, we will help you find a place to stay near either airport to ensure a safe and timely arrival in Nosara. ...maybe jungle planes are. Another option to get to Nosara are inner-country flights. They are both quick and reliable. Two small airlines fly into Nosara, (Sansa and Nature Air) and if you chose to fly from San Jose to Nosara, a MANDATORY 4-WHEEL DRIVE rental car can be arranged for pick up upon arrival. This must be done way in advance. Nosara is well off the beaten track! We will arrange for someone from the HARBOR REEF to meet you at the airstrip with the keys for your stay. Fiding your way around Nosara will become easy. There is only one main road and as soon as that becomes clear, it's all good. Below is a local street map. You'll note where I have drawn in the house, just north of the Rio Nosara and the only real bridge in the entire area. La Casa Que Canta is very close to 2 supermarkets, the airport and many restaurants in downtown Nosara. (See our recommendations on the Activities page). It is about 5-10 minutes from Playa Pelada, the closest and best swimming and tidepool beach. The main surfing beach is Playa Guiones and it takes between 10-15 minutes to get to surfing there. Below is another link to a local map and travel service. On this site you will find a rough sketch of many of the places to eat and see, especially in the expatriate town of Guiones. There are many hotels and different style restaurants in the area and we have tried to eat at them all. So far we have yet to find one that we would not recommend!